Domain Authority and Page Authority are the MOZ metrics. The metric is used to rank domains and Web pages according to their ranking, importance and popularity. Google also gives preference to MOZ score to rank websites in SERP. So, it’s very important for a webmaster and SEO specialist to concentrate on MOZ metrics to gain SERP benefits. The DA and PA score is given on the scale 1-100. The MOZ score depends on three things domain age, website content and popularity. It’s hard to achieve 100 DA and PA score. Only a few websites like google, Facebook, Twitter have reached the peak of MOZ metrics. But, you can reach to 40-50 DA in 6-7 months by working smartly on your website. A) Content: – The world says “Content is king”. This statement is true because every website feeds content in text, graphics, image, and video format. You should update your website and blog regularly to increase the content. A 5-page website can’t achieve good DA and PA score. You need to increase the content on your website by adding articles and web pages regularly. So, a website and a web page with more content will gain more DA and PA. You should write articles with at least 700-1000 words. Here is the best example, how a web page has gained 29.53 PA with 2000+ word article without backlinks. It has 4.15 MOZ rank. The web page has 2k+ word count. B) Social popularity: – Social popularity also helps to increase DA and PA of a website. This webpage has just 120-word count with a link list. But, here the social media score works for it. The web page has 28.08 Page Authority. and 4.15 MOZ rank.This webpage has total 52 backlinks with 440 social media count. Though the twitter count is unavailable because twitter has stopped the API services in November, 2015. C) Profile links: – Profile links are the best ways to increase DA speedily. MOZ welcomes both no-follow and do-follow backlinks. So, make backlinks and profile links from high DA websites to take a long jump to increase 10-15 DA score. D) Subdomains: -If your web doesn’t have subdomains then your efforts are worthless. You can check Jimdo, Weebly and other websites having millions of subdomains. These websites have 80+ DA and PA. So, make few subdomains and post few posts inside it. MOZ metrics are different from Search engine’s algorithm. So, don’t take backlinks from a single or selected websites, do enlarge the circle and grab backlinks from different sources. 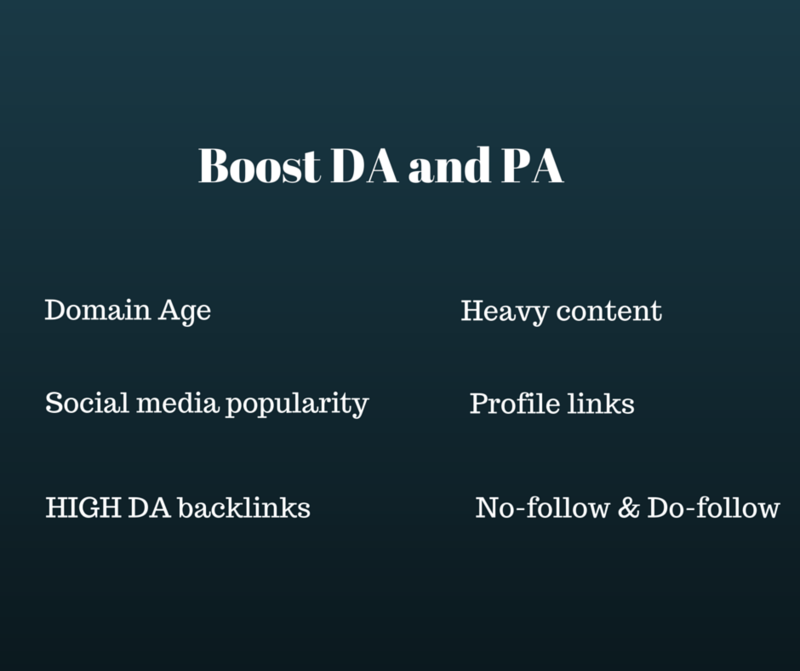 For e.g: – 100 backlinks from a single website will not affect DA and PA but 100 backlinks from 100 websites will definitely improve the DA score. Follow these proven techniques and give a blast to DA and PA score. Really awesome tips to increase DA. I’m sure i have plenty of these to implement.